Rainwater sent the levels of Cedar Creek up last week as the Polk County area experienced days of stormy weather, which brought inches of rainfall. The creek was near flood levels in several areas of Cedartown. How will people in Polk County likely remember the past days, and probably the month of February? It's been wet. Mother Nature let loose the waterworks for several days over the whole region, prompting flood watches and seeing areas around Euharlee Creek and Cedar Creek become temporary swamps. Baseball fields were left empty at the high schools, tennis courts were drowned out for the whole week. No practice was possible on Biggers Field, which ended up completely underwater by week's end. As of last Friday when the paper was being wrapped up, at least 7 inches of rain had come down, and more was expected to add to the total for the week. Unfortunately, there's the potential for more rain on the way. During last week's rainfall, Cedartown's Public Works department did report a sewer spill due to the large amount of rainfall. Somewhere between 6,000 and 8,000 gallons of sewage escaped the system during localized flooding around Spruce Street, where one of the flood pumps stations became overwhelmed by the amount of water. They did take some measures to clean up the area, but wet weather continued throughout the week and waters rose further. To the point where officials in Cedartown shut down a portion of Furnace Street that connects West Avenue with Wissahickon Avenue that became flooded by Big Spring. City Manager Bill Fann said that flooding began after officials took the steps to close flood gates that control the flow of water into Cedar Creek from the spring, which supplies Cedartown with water. In Rockmart, the floodwaters rose in Seaborn Jones Park as they usually do, but hadn't completely inundated the area as of Friday morning last week. Rainfall was expected to continue through most of the weekend at press time, and clear up as the week began. The early week forecast did provide some hope of sunshine, and with temperatures more in the spring-like range. At one point during the month, the thermometer in the area was well above 70 degrees. Check back on weekday mornings for updated forecasts for Polk County from the National Weather Service, and fingers crossed that everyone gets a chance to dry out. Aragon City Council members refused to give an up or down vote to the latest financial report, the second month in a row the council chose to not provide a motion on the regular report. The hope for the City of Aragon is to hold on for a few more months and only spend when absolutely necessary as they wait for infusion of revenue to help bulk up their bank accounts and keep operations on track. Aragon's financial consultant Rick Hartley said the city needs to stay away from any capital expenditures and stay small until checks come in covering local property taxes, utility franchise payments and stay conservative in the months to come to avoid running out of funds. For the past several months, the Aragon City Council has questioned why expenditures keep overrunning the amount of revenue available, forcing officials to dip into funds set aside in the Special Assets Account, and have not yet opened an account the council voted to open and put strict stipulations on the use of that money. "I've already looked at – and this is just preliminary – I've already looked at what we brought in for this month and what we've spent," Hartley said. "We're in the red by $10,900. But the good news is that next week we're getting the $12,000 LOST check, which will help us get through that." He said unless an emergency comes up, the city has already covered expenses for the month of February, and payroll won't push through again until March 1. "On March 1, we hope to get our power check from Georgia Power. Last year it was $34,300," Hartley said. "So I'm hopeful that it's at least that, if not even more." Additional funds have come and gone from the city's coffers, and Hartley is hopeful that by the end of the month this week and heading into the rest of the fiscal year that closes in June, the city can continue operating without issues. "I'm hoping that we'll have a positive month for a change, and then we're rolling into tax season and collections and so we'll have a few good months, and then hopefully we can funnel some of that money into the savings fund," Hartley said. Council member Debbie Pittman asked if the account – which was approved to be open in late 2018 – had been opened, Hartley said it hadn't. When pressed by Council member Judd Fee about the legalities of whether consequences were involved for having not yet followed the council's order they sealed in a vote. "We're all trying to do what is best for the city," he said. "But my question is what happens when something like the Emergency Fund isn't opened but was established by the council. What happens when things don't get done?" City Attorney Zach Burkhalter said that if the council voted for it to be established and it wasn't opened, then that could be a potential problem. However, he did point out that if no funds were available at the time to open the account immediately, it couldn't be established. Funds were supposed to be used to open that account from the sale of equipment Public Works previously owned to collect trash, and the cans the city gave out to account holders to roll out on the roadway. Those all were rounded back up and sold and the city instead used the money to put back into the Special Assets Account. A transfer back out of $13,173 during January was used to pad the general fund balance, leaving the Special Assets Account with only $1,145 at the end of Jan. 31. The city used an additional $5,854 from the Special Assets Account to pay Waste Industries their monthly costs. Other funds on the city's books include $10,232 from the 2014 Special Purpose, Local Option Sales Tax fund and an additional $88,039 in SPLOST Recreation fund. Another $539 was available in the Police Department's seizure fund. No immediate balance was available as of press time. "January and February were tough, we got pretty low into the bank account," Hartley said. He did add that plans are to establish the Emergency Fund account to grow a surplus again once tax collections are in, and insurance premium checks later in the coming fall months to pad the account. Part of the problem is general spending and larger bills than expected. Revenue and expenditures don't always match up to the time of the year when the city needs money, and in some cases bills come in greater than expected. Mayor Garry Baldwin pointed to a $24,000 Workers Compensation Insurance bill the city wasn't expecting to have to pay out as one reason why it has been hard for the city to catch up. Hartley added turnover and capital expenditures also haven't helped. "It's got to get to the point where we've got to push stuff aside, and I think part of the problem was with the Special Assets was there wasn't a policy for what it was to be used for," Hartley said. "... It's gone now. I'm not going to play the blame game. We're all in this together." However, financial controls put in place by the council to curtail spending issues by placing limits of $50 on personnel and Mayor Garry Baldwin as the upper limit for being able to use funds without putting in a request to Hartley haven't been followed. When asked pointedly, Hartley said those controls haven't been followed fully, even though the Council approved a spending limit in past months. "I don't see everything, no," Hartley said. Pittman added that "That's what we said. That everything was supposed to be going through you." Obviously, some bills like power, water and internet have to be paid. But other spending is happening without his authorization. "We've got that issue, we've got the issue with the debit card, and we've got the issue with the Emergency Fund," Fee said. "All of these things that have passed, and none of it has been done." Debit cards were supposed to be locked up, but Baldwin said they weren't because "we have to use them." He further explained they were being used to pay bills. "We're just making sure this is being followed the way we set it up," Pittman said. Baldwin added that he's not tracking "every single dime, but I know pretty well what's... everything major that we need to do Rick is in on. We talk frequently, every nickel and dime." The discussion over finances continues in Aragon, but for the second month in a row the council decided not to put forth a motion to approve the monthly financial statements and the measure died without a vote. See this story online for additional documentation and audio from both the council's work session and regular sessions last week. Polk County Sheriff's Office's Scott Ford talks about the security assessment he made of county buildings in recent weeks. Security is a growing concern for Polk County officials within their several buildings, and the needs for greater protections only grows after an assessment was made by the Polk County Sheriff's Office on local facilities. County Commissioners heard from the Sheriff's Office's Captain Scott Ford in a follow-up after he provided additional instruction and heard the concerns of employees during a recent tour of county buildings, and made several suggestions on how improvements can be made with some immediate low-cost spending, and other areas that might cost additional funds. More specifically, Ford wants to see items like panic buttons that can alert 911 of issues immediately of problems or a situation like an active shooter and send officers immediately to a facility, and ways for people to escape but also block the ability of a shooter to get at employees or those who are coming in for legitimate business. "We went through most of all the buildings and went through and heard what their concerns were about their safety," Ford said. He pointed toward examples of disgruntled citizens coming in to county buildings wanting to discuss a problem that might be armed, and toward heightened security needs ahead of the forthcoming 2020 Presidential election as another. Some protections already exist for Polk County buildings. For instance in the County Administration building in Cedartown, the interior includes several vault spaces for people to utilize in such an instance, and some protections for people who are looking to get out. However, Ford said the county needs to look at barriers within these offices and buzzer systems to control the access of people who might come in with ill intentions in mind. He also wants to look at securing doors at county buildings to ensure public access is limited to certain areas, and in specific addressed the need for greater courthouse security. That would include blocking access between the two side courthouse entrances in Cedartown, and also look to block roadway access between and behind the courthouse to provide greater security access for judges and court employees overall. He specifically said the idea behind closing off the space between the two courthouses were to provide greater security to keep inmates within a controlled area and prevent the potential for escape. "We've got several high profile court cases coming up," Commission Chair Jennifer Hulsey added. She said it was an area the county needed to address soon as those cases come to trial, including the recent shooting death of four and injuring of a fifth victim in Rockmart in January, and the shooting death of Det. Kristen Hearne in 2017 as that case progresses in court. A greater amount of security cameras are also needed for many of the buildings, Ford said. That would provide employees the ability to ensure that when they are walking out to their vehicles, they will know if someone is waiting for them in the parking lot or if people who aren't supposed to be in an area are skulking about. Ford said he met with employees first as a group as he went from building to building, then heard from individual departments as his assessment went along. He did add that employees questioned a county policy that doesn't allow them to carry firearms into buildings for their own self-protection, but does allow citizens to bring in weapons with proper permitting as a sidearm into the county administration building, as an example. Security and safety of county employees will continue as an on-going discussion as more specific requests are turned into potential projects for upgrades within the building. However, the county is wary of investing too much money into facilities they may one day seek to replace or completely renovate in the future. Commissioner Chuck Thaxton pointed toward that and needs for upgrades at several volunteer fire stations around Polk County as examples of how the county might get greater benefits from full upgrades of facilities through planning now, instead of looking to make changes from one area to the next without a cohesive vision in mind. The Public Safety Committee's February session focused too on the volunteer fire stations and getting back into planning for the future of the department, with a specific immediate request for an upgrade from Public Safety Director Randy Lacey. Lacey asked the committee to look at upgrading software capabilities for the department which would help in tracking hours for volunteer firefighters and speed up the flow of reporting for state and insurance requirements. He said it wasn't yet programmed into his budget for FY 2020, but that he planned to add the cost of the software with the Commission's approval. He also said getting broadband to a few of his stations remains difficult, and that too was an area where Hulsey said the county already was working toward making improvements. Connectivity issues are being felt at the most rural of stations in Antioch and Esom Hill, where prior to Lacey's arrival didn't have phone service. They do now have fax machines able to send reports, but he said they don't always work. The committee also heard updates on the roofing project at the Polk County Jail, which was on an immediate hold due to wet weather last week, and from Polk County Police Chief Kenny Dodd, who said the department headquarters roof had also sprang leaks and needed repairs. Reliable Heath Care Management officials joined with officials from the City of Rockmart to celebrate the groundbreaking of The Cottages at Rockmart on Goodyear Avenue. This was one of several renderings of cottage-style housing for The Cottages at Rockmart, a new nursing and rehab facility in Rockmart that will feel more like being in a home than a long term care facility. 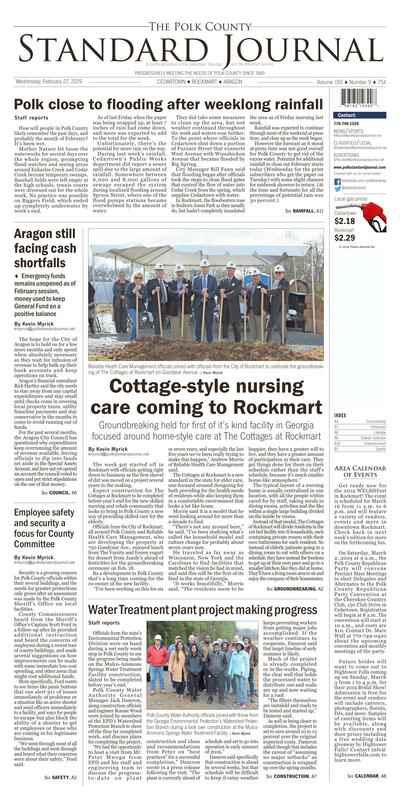 Officials from Reliable Health Care Management spoke about the great need to change the model for long term care by providing residents with a place that feels more like home, the goal of their new development The Cottages at Rockmart. The week got started off in Rockmart with officials getting right down to business as the first shovel of dirt was moved on a project several years in the making. Expect construction for The Cottages at Rockmart to be completed before year's end for the new skilled nursing and rehab community that looks to bring to Polk County a new way of providing skilled care for the elderly. Officials from the City of Rockmart, all around Polk County and Reliable Health Care Management, who are developing the property at 750 Goodyear Ave., enjoyed lunch from The Varsity and frozen yogurt for dessert from Jandy's ahead of festivities for the groundbreaking ceremony on Feb. 18. Its a development in Polk County that's a long time coming for the co-owner of the new facility. "I've been working on this for six or seven years, and especially the last five years we've been really trying to make this happen," Andrew Morris of Reliable Health Care Management said. The Cottages at Rockmart is a new standard in the state for elder care, one focused around designing for both providing for the health needs of residents while also keeping them in a comfortable environment that looks a lot like home. Morris said it is a model that he went looking around for more than a decade to find. "There's not any around here," he said. "I've been studying what's called the household model and culture change for probably about seven years now. He traveled as far away as Wisconsin, New York and the Carolinas to find facilities that matched the vision he had in mind, and said this will be the first of its kind in the state of Georgia. "It works beautifully," Morris said. "The residents seem to be happier, they have a greater will to live, and they have a greater amount of participation in their care. They get things done for them on their schedule rather than the staff's schedule, because it's much smaller home-like atmosphere." The typical layout of a nursing home is usually centralized in one location, with all the people within cared for by staff, taking meals in dining rooms, activities and the like within a single large building divided on the inside by rooms. Instead of that model, The Cottages of Rockmart will divide residents in the 116 bed facility into 8 households, each containing private rooms with their own bathrooms for each resident. So instead of elderly patients going to a dining room to eat with others on a schedule, they have instead the freedom to get up at their own pace and go to a smaller kitchen like they did at home. They'll have a living room area to sit and enjoy the company of their housemates. They'll still enjoy the same level of care, get to know the staff as intimately as a family member. The Cottages at Rockmart just takes a different approach with the model, mixing home health care and residential facility care into one community-based model. Reliable Health Care Management wants to drive resident's lives toward what it was like at home – mainly being in the social areas of a home or the kitchen – instead of keeping to their rooms. The best part is the short distances residents will have to travel to have all their needs catered to when they live at the Cottages of Rockmart. "They'll be able to smell the cooking, which will help with their appetite," Morris said. "They get to participate. If they want to help wash their personal laundry, we will help them do that." Families won't have to go through a check-in process when they come to visit either, and it will feel more like pulling up to the family homestead in a neighborhood than a true facility. "They'll go ring the doorbell at the front door just like they were going to someone's home," Morris said. He said the idea was to give residents more dignity as they continue in their elder years and need greater amounts of help and care on a full time basis. "It gives them more meaning," he said. At present, Morris operates Cedar Springs Health and Rehab with 62 residents receiving care. All of those will get to move into the forthcoming facility, leaving an additional 54 rooms that will be available for new additions to the cottages. Morris expects once construction finishes before the end of 2019 – he's hoping for a 10-month timetable to complete the development – the Cedartown facility will be closed up. "We may sell that to someone for another purpose," Morris said. The eight residential building and an administrative building were designed by Christopher Baldwin of Baldwin Architectural Group of Atlanta. Van Winkle Construction of Atlanta will be the lead contractor on the project. The latest development brings more expansion along the corridor around the Nathan Dean Bypass in Rockmart which Mayor Steve Miller said continues growth begun more than a decade ago. He added that it comes to also fill a growing need in a new way. "To be the first in the State of Georgia is quite an honor," he said. "We're looking forward to a long association with the folks who are running The Cottages at Rockmart." Polk County Water Authority officials joined with those from the Georgia Environmental Protection's Watershed Protection Branch during a look over construction at the Mulco-Ammons Springs Water Treatment Facility. Work continues on the Mulco-Ammons Springs Water Treatment Facility being built by the Polk County Water Authority. Officials from the state's Environmental Protection Division were on hand during a wet early week stop in Polk County to see the progress being made on the Mulco-Ammons Springs Water Treatment Facility construction, slated to be completed before year's end. Polk County Water Authority General Manager Jack Damron, along construction officials and engineer Ronnie Wood were joined by members of the EPD's Watershed Protection Branch to show off the thus far completed work, and discuss plans for completing the project. "We had the opportunity to host a visit from Mr. Peter Mwogu from EPD and his staff and engineering team to discuss the progresst to-date on plant construction and ideas and recommendations from Peter on "best practices" for a successful completion," Damron wrote in a press release following the visit. "The plant is currently ahead of schedule and set to go into operation in early summer of 2019." Damron said specifically that construction is ahead by several weeks, but that schedule will be difficult to keep if rainy weather keeps preventing workers from getting major jobs accomplished. If the weather continues to cooperate, Damron said that target timeline of early summer is likely. Much of the project is already completed or in the works. Piping, the clear well that holds the processed water to distribute out and walls are up and now waiting for a roof. "The filters themselves are instaleld and ready to be tested and started up," Damron said. As well as being closer to completion, the project is set to save around 10 to 12 percent over the original expected costs. Damron added though that includes the caveat of "assuming no major setbacks" as construction is wrapped up over the spring months. "Our contractor, PF Moon Incorporated is completing their work against our timeline as we projected," Damron said. "The EPD was pleased with our progress thus far, and will be back for plant start-up and testing closer to our completion date." The team who came for a visit on Feb. 19 also got a tour of the site and both Mulco and Ammons Springs. "The visit was beneficial for us to discuss the functional aspect of the plant, helping us meet EPD staedning requirements as well as listening to suggestions for a smooth start-up and bringing the plant online," Damron said. "Their support and understand of how the new plant will fit into our system is critical. We look forward to working with EPD for a successful launch and continued operations into the future." Future brides will want to come out to Hightower Falls coming up on Sunday, March 3 from 1 to 4 p.m. for their 2019 Bridal Show! Admission is free for the event and vendors will include caterers, photographers, florists, DJs, and more. Samples of catering items will be available, along with discounts and door prizes including a free wedding date giveaway by Hightower Falls! Contact info@hightowerfalls.com to learn more. Belles of the Ball are bringing the chance for girls in need to have a chance to get a free prom dress for the forthcoming season. The organization is holding their second event in Atlanta on March 16 at the Atlanta YMCA off Pryor Road. The group's inventory includes more than 500 dresses, and DJs, food, vouchers for free hair styling and more are part of the fun. Contact bellesofball@gmail.com for more information. S.C.A.R.S., or Second Chance Addiction Recovery Solutions, will begin meeting at the Goodyear Civic Center in Cedartown on Wednesday, March 6 and will continue on weekly on Wednesdays following at 6:30 to 9:30 p.m. S.C.A.R.S. is a faith-based, 12-step recovery program that includes a meal and worship services following the group session. The program is being organized by Wesley Chapel Community Church of Cedartown. Contact Joshua Nichols at 404-938-2075 or Scottie Ray at 678-988-9056 for more information. Cedar Lake Christian Center is a nondenominational community who invites anyone looking to find the Holy Spirit within them to come join in worship services on Sunday mornings at 10:30 a.m. with the Rev. Neil Hopper, along with Hispanic services as well to the community. Those interested in participating can join in at Cedar Lake Christian Center, located at 1890 Rome Highway, Cedartown. For more information call 770-608-0651. Join the Church of God of the Union Assembly, 32 Prospect Road, Rockmart, for praise and worship weekly. The church welcomes anyone to come and worship regularly on Sundays and Wednesdays as well. Praise and youth services are held at 7 p.m.